Locally situated in the Endeavour Hills area, Endeavour plumbing is proud to be the premier plumbing service for the residents of Endeavour Hills. Plumbing appliances are among the most widely utilised by people throughout day to day life, making them prone to malfunctions or becoming defective.Our team has many years of experience in the plumbing trade, and has learned to deal with all kinds of plumbing related issues.We have a group of expert plumbers, ready with all of the tools needed to complete the job at hand, without having the need of acquiring additional parts or equipment. Our client base in the Endeavour Hills extends from individual residential clients, to commercial, industrial, and corporate clients needing assistance in larger establishments.Depending on the setting, and the plumbing appliance, our team will determine which equipment will be of best fit, in order to complete the job in the most efficient manner possible. We know that too often, plumbing emergencies occur at the most unexpected times. Due to this, we are available for service 24 hours a day, 7 days a week, so no matter when you may need us, we will be there. 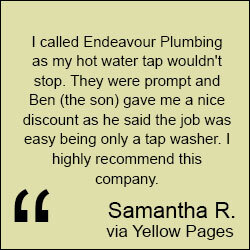 At Endeavour Plumbing, we place an emphasis on the importance of excellent customer service.We take pride in being known as a reliable and reputable company that can always be trusted.When receiving services from Endeavour Plumbing, our clients can rest assured that we will treat them in the most professional manner. Our plumbers are all thoroughly trained and possess knowledge of all plumbing system requirements. If you have any questions or concerns, we always take the time to address them and make sure that you are completely informed about the progress of our work. Our affordable pricing does not compromise the top quality service that you will receive from all members of our staff. If you need plumbing services in Endeavour Hills, reach out to us through our website, or give us a call. One of our team members will assist you with all of your inquiries! We also provide plumbing services in Metro and surrounding suburbs such as our plumbing services in Richmond, if you're looking for the quickest service speak to our expert plumbers today.